Nominated for Best Animated Feature at the 2017 Academy Awards, The Red Turtle marks an unusual pairing of Studio Ghibli and a non-Japanese animator. Famed director Hayao Miyazaki retired from the company, but was instrumental in creating this film, campaigning to land Michael Dudok de Wit as its co-producer, who would go on to write and direct as well. The Ghibli magic is on board for this feature, though the result is not typical, if you’ve come to know & love their work. This time, the story is much more interpretive, much less youthful, and carries a weight around its neck that can drag down those not prepared for the sadness and also the beauty. An unnamed man is shipwrecked and alone, cast about the waves of the sea like a toy in a tub. Miraculously, he washes ashore on a small island, a place with nothing except a few native animals, a pool of fresh water, and a bamboo forest. He survives, but loneliness drives him near insanity, and he knows he must leave that place. So he builds a raft, with fruit & sails & possibilities, only to have it dashed to pieces by an unknown ocean creature. He returns to the beach, builds another raft, and tries again, only to have the same outcome repeat itself. Eventually, in his anger and desperation, the man takes out his rage upon the animal, not knowing that he will release a life force that will change the course of his own future. 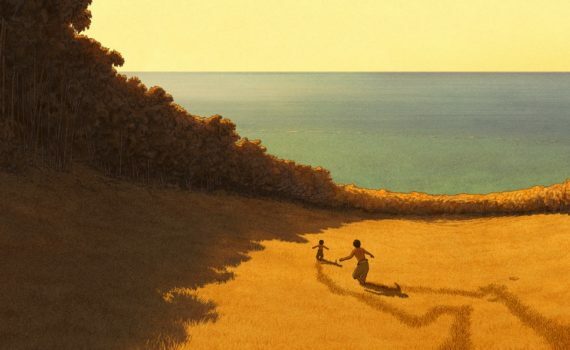 The Red Turtle is such an original and wonderful film, an instant, animated classic for adults that kids should be watching instead of Minions, a movie that matters in the way that not many can claim. Even with none of the characters speaking except for the occasional “Hey!”, the mood was loud & clear, the message perhaps being a bit more subtle and requiring some time to process after watching. It’s heart-warming, heart-breaking, and constantly emotional, a roller-coaster of peace & peril that we can all recognize as the framework of life. And the animation is wonderful, the way the shadows are drawn so perfectly, the way the color changes as the sun shifts. This is a delightful movie, something worth watching if you want something other than the standard Pixar fare.